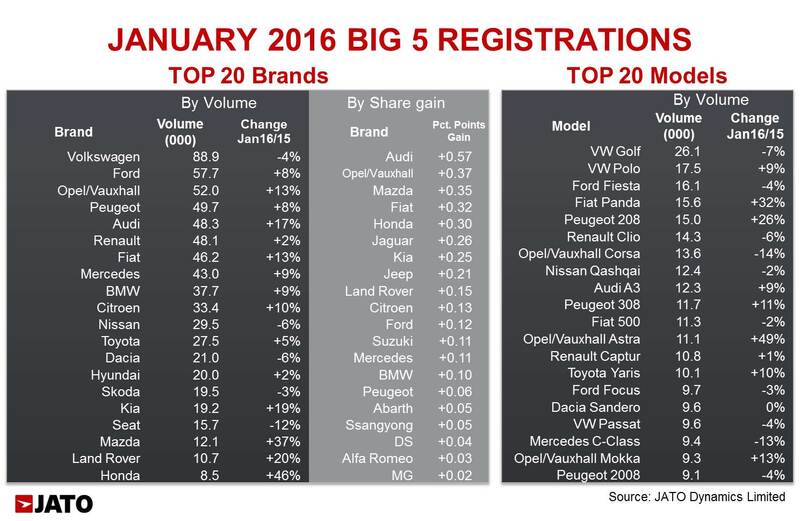 The latest analysis from JATO Dynamics points to a positive start to 2016 for Europe’s ‘big 5’ car markets. A total of 759,600 units were registered in January in Germany, UK, Italy, France and Spain, representing average growth of 6.7% compared with January 2015. Registration volumes grew in all five markets but at different rates as Italy and Spain continued to outperform the overall result by posting double-digit growth. Last month Italy’s outstanding results (+17%) meant it outsold France and became the third largest market in Europe with 156,200 units. This performance brought Italy closer to the UK, with the gap closing to just over 13,000 units. Year on year the market made a significant jump from January 2015, when the Italian new car market counted for 18.7% of Europe’s big 5 total, to January 2016 when its share jumped to 20.6%. Part of the increase was explained by a pick up in the number of commercial deals. Germany was ahead with more than 218,000 units, but posted the second lowest percentage increase (+3.1%). In the UK, even with a registrations increase of only 2.9%, the market achieved its highest January total for 11 years, thanks mostly to private registrations. French registrations increased by 3.9%, and Spain closed the top 5 with 77,400 units, up by 11.6% on January 2015’s results. Volkswagen was the best-sellling brand in these markets with 88,900 new cars. Its registrations fell by 4.1%, amid the emissions issues affecting its performance in Germany (-8.8%) and in the UK (-13.8%). The German brand was the only one in the top 10 to post negative growth. Its market share dropped significantly as a result, from 13.0% in January 2015 to 11.7% this month. Ford came next with 7.6% market share and registrations up by 8.4%, driven by its German (+18.9%) and Italian (+18.6%) results. The big volume winner of the month was Opel/Vauxhall with an increase of 12.8% in registrations to 52,000 units, representing a 6.9% market share. It occupied third place in the brands table. Audi in fifth place posted the highest percentage change as its registrations grew by 17% thanks to double-digit growth in four of the five markets (the UK was the exception). The premium brand was closely followed by Renault which fell three positions in the ranking, passing from third place in January 2015 to sixth last month. The French car maker posted the lowest positive growth in the top 10 due to falls in France, Germany and Spain. This was not true of Fiat, the next in the ranking, whose registrations went up by 12.7% to 46,200 units, with 70% of them coming from Italy (+19%). The top 10 was completed by two other German premium brands – Mercedes and BMW – and by Citroen (+10%). Outside the top 10, Nissan’s fall (-5.9%) allowed Toyota to cut the gap (+4.6%) to less than 2,000 units. As a result, Nissan only just retained its position as the best-selling Japanese brand in Europe’s big 5 markets. Dacia, Skoda and Seat posted reductions in their registrations while Kia, Mazda, Land Rover and Honda achieved double-digit volume growth. Other good perfomers included Suzuki, Jeep, DS, Alfa Romeo and Jaguar. The Volkswagen Golf led the ranking by models with 26,100 units, down by 6.8%. However, it reached its lowest market share of the last three years at 3.43% (January 2015: 3.93%, January 2014: 4.15%). It was followed by the Volkswagen Polo, which thanks to its positive growth, (+9.1%) was able to outsell the Ford Fiesta (-4.4%) and became the best-selling subcompact. The big surprise was the Fiat Panda in fourth place with 15,600 units, jumping from eighth position in January 2015. The rise of this city-car was possible thanks to Italian sales (+42%) which counted for 86% of the total. The Peugeot 208 also posted a big increase (+26%) outselling the Renault Clio (-6.3%) and Opel/Vauxhall Corsa (-14%). Among the best performers were the Opel/Vauxhall Astra (+49%), Citroen C3 (+23%), Fiat 500X (+249%), Kia Sportage (+30%) and Audi Q3 (+64%). “These encouraging January results did not follow the same pattern seen in recent months. Most of the growth was driven by only two markets and not all the car makers benefited from it. The volumes growth in Europe’s big 5 was driven by SUVs which topped the segments ranking, increasing registrations by almost 23%. Meanwhile the compact segment grew by only 5% and demand for subcompacts continued to stall” concluded Felipe Munoz, Global Automotive Analyst at JATO Dynamics.